The following information is provided to help you save time and avoid consternation. Should you have any questions, please call, click or come by the Microcomputer Maintenance Services Shop. Sage Hall, Room 330 | Hours: 8 a.m.-5 p.m. Please refer to the detailed contact information for more about shipping, parking and technical staff members. NOTICE: Any data on your hard drive that you do not want to lose should be backed up prior to your visit to the MMS Shop. The MMS Shop is not responsible for data loss. Did we say back it up? It bears repeating: back up your files before taking in your computer for any kind of service. Please consult with your department's technical support personnel, if you need assistance with data backup or recovery. Also, remove all CDs, DVDs, USB devices and secure digital cards, SD cards, from your computer before taking it in to the MMS Shop. IMPORTANT: A computer's operating system may need to be reinstalled, called a clean install, as part of the diagnostic process. A clean installation will overwrite all of the computer's current data. Be sure to back up your data before turning over your computer to the MMS Shop. All hard drives that are replaced under warranty are returned to the vendor as required. Before leaving the MMS Shop the computer drives are degaussed, the process of reducing or eliminating an unwanted magnetic field, or data, that is stored on tape and disk media, such as computer and laptop hard drives, diskettes, reels, cassettes and cartridge tapes. Once degaussed, the hard drive will be unusable and will not be recognized by the computer. In fact, the erasure is so deep that the factory written servo tracks on the disk platters are also demagnetized leaving no reference points for the read heads to key in on. Once the drive is degaussed, the data is destroyed – completely. See the MMS Shop's Additional Services regarding Certifiable Hard Drive Disposal. BEST PRACTICE: Regularly back up your data. Always have two copies. Please email your feedback to the MMS Shop technicians concerning specific system behavior patterns that we can collect from users. Thank you. A Dell monitor must be matched up with its original system, i.e., service tag number, in order to justify a warranty claim. In other words, it must have been purchased with that system. The warranty period for the monitor is the same as the system with which it was shipped. If a monitor was purchased separately, the original purchase documentation, such as the invoice or purchase order, is needed to justify a warranty claim. The AppleCare Protection Plan, also called Apple APP, warranty includes mail-in repair for portable computers, so any accidental damage that occurs during the repair process would be the responsibility of the Apple repair technician. Accidental damage is not covered by the standard Apple warranty or by AppleCare. However, accidental damage is covered by AppleCare+ (with a per-incident deductible). Consequently, any MacBooks that are damaged or out of warranty can be diagnosed by MMS Technicians, but will be repaired by Apple with additional cost. The display panels on all newer iMac models are held on with a double-sided tape that runs completely along all four sides. This adhesive is called very high bond, VHB, which makes it very difficult to remove the panel assembly. The panel must be removed in order to perform any repair work inside the housing, also called the case. The glass panel and the liquid crystal display are all one assembly, which makes that one particular part rather expensive. The MMS Shop cannot afford the risk of cracking the glass during disassembly and therefore we must be disqualified from performing this procedure. We can still run diagnostics but we will not open these models of iMac. For the models that are still in warranty, the Apple ACP warranty includes onsite repair for desktop computers, so any accidental damage that occurs during the repair process would be the responsibility of the onsite Apple technician. Consequently, any iMacs that are out of warranty can be diagnosed, but cannot be repaired by MMS Shop staff members. The standard battery warranty for a notebook computer is one year. Batteries are considered consumable parts and a warranty usually is not honored past one year. A defective laptop battery that is still under warranty can be replaced at no charge for “failure due to a defect in materials or workmanship,” but not if it just wears out due to consumption, and not if it has been damaged. For some models, an extended warranty may be available for the battery, which does not cover normal consumption. Only if the battery is defective will it be covered under the warranty. All rechargeable batteries wear out with time and use. As the battery begins to reach the end of its life, you will notice a decline in the runtime of the battery. The life span of a laptop battery depends on a number of factors and is hard to predict. Please refer to MMS Shop's Technical Tips and Troubleshooting for Laptop/Notebook Battery Care. Caution: Be very careful with all liquids when working near a laptop computer! 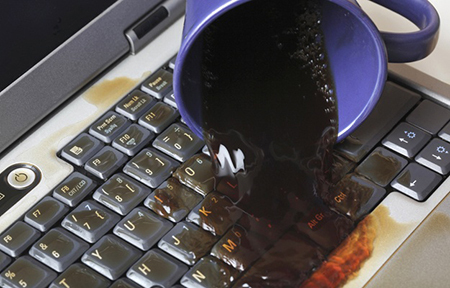 Several recent occurrences of hardware damage to laptop computers as a result of liquid spills recently have been reported. Hardware damage due to a liquid spill may not manifest itself right away and symptoms sometimes are intermittent. Therefore, it is very difficult to determine which internal hardware components sustained irreversible damage. Hardware modules may need to be replaced one at a time over a period of time to eliminate all the affected modules. Best Practice: Keep all liquids away from computing equipment. Integrated replacement parts are more costly. Portable computing devices are becoming smaller and smaller. Therefore these systems are becoming more and more integrated. Components such as memory, video processor, I/O ports, Ethernet, wireless card and Bluetooth could now be part of one individual main board. Other devices such as keyboard, track pad and even the battery may be part of one single assembly. When an individual component fails, then the entire integrated assembly will need to be replaced. When an image, such as a login window is left on the computer screen for a long period of time, you may temporarily see a faint remnant of the image even after a new image replaces it. This faint image is referred to as persistence, image retention, or ghosting, and will disappear over time. This is normal for an in-plane switching screen, IPS display, the technology for liquid crystal displays, LCDs. How to avoid image persistence on Apple displays. Do not use a macOS version, also called a build, that is earlier than the one included with the computer. For now, you MUST use the specific macOS version that was shipped with newer Macs. Learn which macOS versions (builds) originally shipped with or are available for your computer. Alert! CPU 0 fan failure. Alert! Hard Drive fan failure. 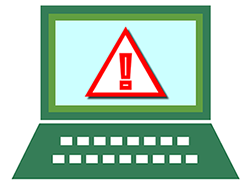 Some Optiplex™ 990, 790 and 390 system errors have been reported to the MMS Shop staff members that exhibit these specific error messages at the point of the POST/boot process. We have very rarely been able to reproduce the errors on these systems even after extensive testing. Some systems may exhibit this anomaly more than others but it is always intermittent. No one system seems to consistently fail. Several people have posted similar findings online. Recommendation from MMS Shop: Try to keep the basic input/output system, BIOS, up to date. Dell posts each new BIOS update with information concerning the update. Sometimes system vendors will repair engineering/hardware flaws with little or no explanation. An article from the Dell online Knowledge Base support page may be related to this problem. As always, please feel free to contact a member of the MMS Shop team, if this seems to be an ongoing problem, especially before your warranty runs out. Applies to Optiplex™ 980 - Intel Quad Core processors require a discrete graphics card. Cannot use the on-board (integrated) video. Certain types of SPS/UPS units are incompatible with Dell Optiplex™ 960, according to Dell. From Dell Web Site: If you are experiencing intermittent NIC connectivity with the Optiplex 755, please make sure you have updated the bios to at least Rev.A09, which is now available on Support.Dell.com. If after you have updated the bios and are still having issues please use normal troubleshooting steps to verify the failed component. If you carry lithium powered items and batteries when you travel, please read this important U.S. Department of Transportation advisory.